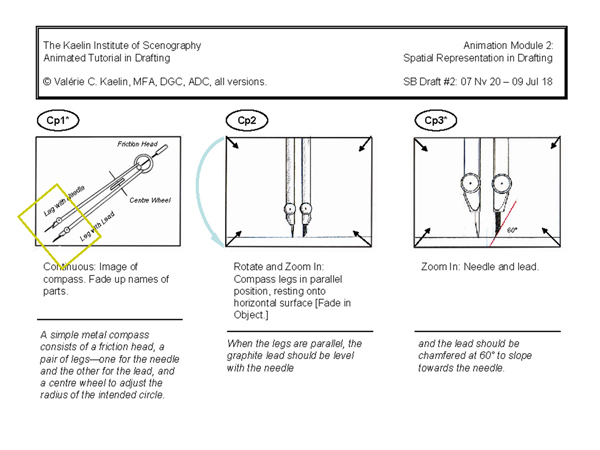 A 2007 Ryerson University Digital Media Projects Office Grant enabled me to write the first of a six-part Flash animation for classroom instruction, which was produced by their instructional technology team. The case for facilitating old technology using new technology rests on key points corroborated by specialists in human spatial performance. - Human spatial cognition is processed through an integration of the visual system, the vestibular system and the proprioceptive systems: all three (Wang et al, 2006). - Individuals lacking spatial dexterity have a better chance of succeeding in a multisensory learning environment (Bradford, 2008). - What enhances the learning performance of the impaired enhances the learning performance of the population at large (Freund, 2001, 2010). - In the Western intellectual tradition, spatial representation rests on a chain of mathematical theory, tools and equipment reaching back to the Egyptians. Staying in touch with that tradition prevents us from surrendering our problem-solving responsibility (Hutchins, 1995). - Our alumni who go on to study computer-aided drafting notice that they progress more rapidly than those who have not had prior spatial training because they have already learned to conceptualize orthographically (Ng, 2012). Module 1 DVD Cover Art. 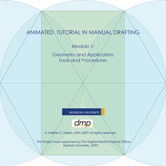 Animated Tutorial in Animated Drafting. 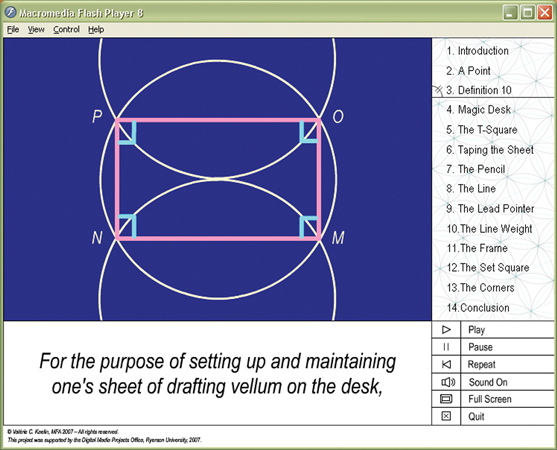 “Module 2: Introducing Conventions of Spatial Representation in Drafting.” Animated Tutorial in Animated Drafting. Storyboard Page Cp1-3. Toronto, 2007-11. Greek constructions are tested against basic drafting protocols. 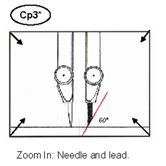 The use of basic equipment: T-square, parallel rule, set square, drafting desk. Proper use of drawing instruments. The Idea of spatial representation. 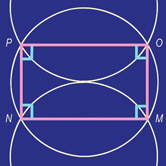 Review and expand Greek constructions to explain isometric templates. Cambridge, MA: MIT Press, 1995. Personal conversation with this DGC Ontario Art Department Apprentice. 2012. Wang, R.F., Crowell, J.A., Simons, D.J., Irwin, D.E., Kramer, A.F., Ambinder, M.S., … Hsieh, B.B. (2006). Spatial updating relies on an egocentric representation of space: Effects of the number of objects. [Electronic Version]. Psychonomic Bulletin & Review, 13(2), 281–286. CMS “The Animated Tutorial in Manual Drafting in Six Modules.” Valérie C. Kaelin Website; Scenography; Pedagogy; January 1, 2013. Accessed Month, Day,Year. http://www.valeriekaelin.net. 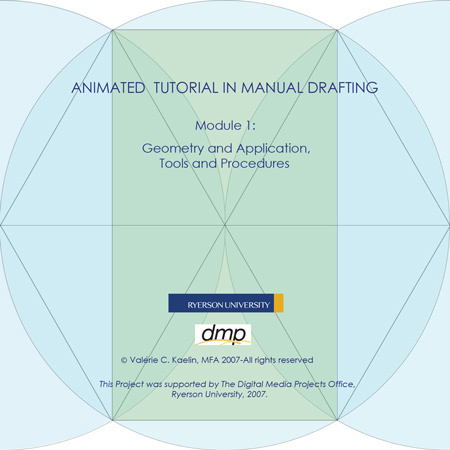 MLA Kaelin, Valérie C., “The Animated Tutorial in Manual Drafting in Six Modules.” Toronto, 1 Jan. 2013. Web. Add Day, Abbreviation for Month, Year.